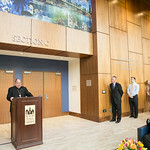 The gallery and lounge within the newly constructed Bethany Hall has been dedicated to Monsignor James Cafone '61/M.A. '67 S.T.D. 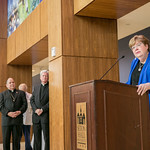 Bethany Hall, itself recently dedicated in honor of President Emeritus Monsignor Robert Sheeran '67, serves as a welcome center for both visitors and the University community, offering event space and meeting rooms for students and alumni. In addition, Bethany Hall functions as the central location for all admissions activities. 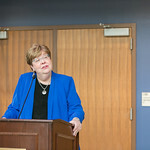 "For many people — especially prospective students visiting campus for the first time — this space will be the first point of contact they have with Seton Hall," said Interim President Mary J. Meehan, Ph.D. "It is important that the building is imbued with a sense of our values and our mission as a University. 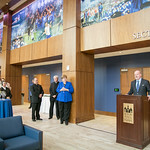 I can think of no better way to do that than to honor Monsignor Jim Cafone; his 47 years of joyful service to Seton Hall, the Archdiocese of Newark and the surrounding communities exemplifies a life of servant leadership and an extraordinary devotion to others." Monsignor Cafone was ordained to the priesthood in 1965. Three years later, having received his master's degree in educational administration and supervision from Seton Hall, he was assigned to the University. Known by generations of students and priesthood candidates as "the big guy," his religious studies classes were so popular that for many years he taught more students than any other University professor. His seminary students, many of whom attended the event, recalled him simply as "Father. Always Father, always there." 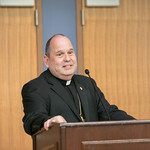 In addition to his priestly parish and archdiocesan duties, Monsignor Cafone served as minister to the priest community at Seton Hall for 15 years; as vice chair of the University's Board of Trustees and as chair of the academic affairs committee of the Board of Regents. Three years before his passing in 2015, Monsignor Cafone received the McQuaid Medal, which is given to faculty and staff members who have rendered outstanding service to the University. A mainstay of Seton Hall for nearly 50 years, he was known as much for his academic erudition as his joy and generosity. An avid chef who mixed meals with a sense of prayer and community, he was celebrated by The New York Times in 1998 for his "heavenly" cooking and his notions about food and spirituality. Father Cafone mixes his passion for teaching and the priesthood with nearly equal portions of enthusiasm for cooking. ''Jesus enjoyed feeding people and even making sure they didn't run out of wine at a party,'' he said. ''We learn to find our joy in serving others when we cook. 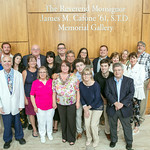 Since his passing, the University has held the annual Monsignor James Cafone S.T.D. 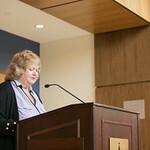 Memorial Lecture, featuring renowned speakers such as Father Leo Patalinghug, who is known as "the cooking priest" and whose philosophy of food aims to bring families back together through the dinner table; and Reverend Daniel Utrecht, C.O., who presented "A Bishop Who Stood Against Hitler and his Lessons for Today." 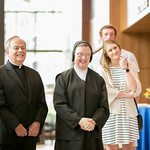 In 2018, the Catholic studies program announced the annual Monsignor James Cafone Catholic Mission Vitae Gaudium ("The Joy of Life") Awards, which recognize University seniors "who demonstrate Monsignor Cafone's spirit of compassion, service and dedication to the mission of Seton Hall and the Catholic faith community." 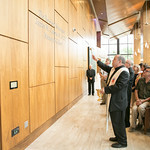 At the gallery's dedication ceremony on June 27, the Most Reverend Manuel A. Cruz '76, Auxiliary Bishop of Newark and a former student of Monsignor Cafone, remembered fondly more than 40 years ago when as a seminarian he served his first Mass and the homily Monsignor Cafone gave that day. "I remember the ending when he said, 'Now, remember this Father, you have begun a life of love.' And that was the mystery of Father Jimmy. He taught us, in many ways, by word and example, how to love." We ask God's blessing on this gallery in this new center of welcome, which will be dedicated to the memory of Monsignor James Cafone. 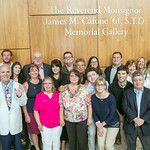 We ask that those entrusted with the education of young people in this institution may teach their students how to join the discoveries of human wisdom with the truth of the Gospel, so that they will be able to keep the true faith and to live up to it in their lives after the wonderful example of Monsignor Cafone. We also ask the Lord that the students will find in their teachers the image of Christ, so that, enriched with both human and divine learning, they will in turn be able and ready to enlighten and assist others. Having given the lead gift for the construction of Bethany Hall, Board of Regents member James O'Brien '82 and his wife, Judy, were asked if they would like the gallery to be named in their honor. James O’Brien recounted that although he and his wife thought and talked about it, they "weren't sure who would ever be inspired by the James and Judy O’Brien Gallery." 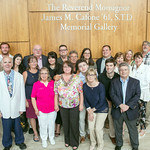 With inspiration as the naming criteria, however, they quickly moved to Monsignor James Cafone. A business major, James O’Brien recalled with some sense of disbelief that Father Cafone's religious studies course was his favorite class at Seton Hall. "He made a big impression on me," O'Brien said. 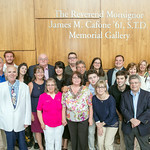 He then told those gathered how, years later, his "heart would swell to four times its normal size" as he thought of his close friendship with Monsignor Cafone, which developed as they served on the Board of Regents together. "We are honored," said O'Brien, "to have this opportunity to name this beautiful space in his memory." Monsignor Cafone's older brother, Michael, spoke for the large Cafone family in attendance when he called for an ovation for James O'Brien and said of his brother, "He was the light of all of our lives and I would like to publicly thank Mr. O'Brien for this. When I saw this beautiful space, I cried. Thank you."